Fall Cleanup: New and Improved! Middle Smithfield Township Fall CLEAN UP: New and improved! 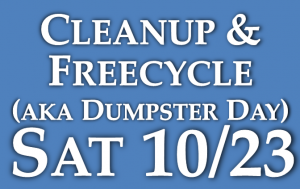 Middle Smithfield Township’s annual Fall Clean Up will be on October 23rd & 24th. Our Freecycle Event will be on October 29th, 30th and 31st. Residents can drop off their gently used items with the knowledge that they won’t go to a landfill – but one of their neighbors or a charitable organization instead! 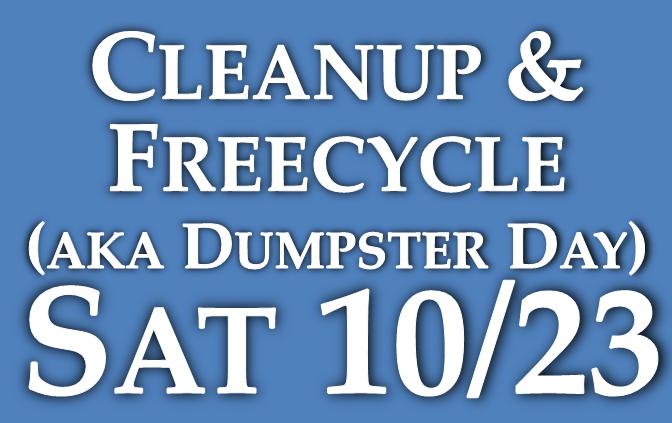 Everyone wins – the Fall Clean Up costs the taxpayers less money (less dumpsters), Pennsylvania landfills don’t fill up as quickly, and residents and local charities receive needed goods at a price that can’t be beat – FREE! Residents are responsible for unloading their own vehicle, the township employees will be available to assist if necessary. Clean up is for Middle Smithfield Township residents. Please bring proof of residence such as a, tax bill, rent receipt, etc. This clean up is an extremely “user friendly” program. We urge all residents to take advantage of this opportunity. A great way to dispose of unwanted household goods!!! The New and Improved Fall Clean Up’s “Freecycling” means residents can bring household items, working appliances, furniture, books, and toys in good condition and leave them here for other residents and charitable organizations who may need them to pick up for free.